Having taught in International schools with their diverse populations for some time, and before that in Montreal with its gentle mix of cultures I have never, until now taught in a school with single ideology. Now my class is full of students of one faith, one culture, one nationality and one common background. At times it unnerves me, sometimes I am surprised but most often I am quietly jealous of their sense of belonging. There are things that are certain. Every Friday they will gather with their whole family at the grandparents’ house for a lunch time meal. Every summer they will leave Bahrain and visit London or the States. Every weekend they will see the same friends and family that they have been seeing for all the weekends of their lives. Each school day they will come and sit beside a friend they have known since kindergarten. They will probably leave for university but then almost definitely return to live close to family. They will marry someone they know, or who is at least known through association. Each day, at some point, maybe for some during school in the prayer room, maybe for others later in the privacy of their home, they will pray. But for all religion is not only a quiet focus in their lives but a central source of purpose. During one of my outside duties I observe a number of students, certainly not the majority, but a handful, walk over to the prayer room, remove their shoes and enter for about 5 minutes. And I am always surprised. That they take time away from their already short lunch break, that they find comfort and solace in the simple act of homage and that religion shapes the structure of their days. But there are many who struggle with the daily injustice they see before them, who are thinking and critical young adults, more aware than many I taught back in Montreal. They have an awareness of their culture that rests within the certainty off all it offers them. Often I feel I am the student. But isn’t that the way real teaching should be? It is entirely likely that I am learning more than my students. Just this week I have picked up some unknown tidbits that serve me well when we sit down en famille to dinner each now. I am greeted with raised eyebrows, nods, hmmms and even a few “wows”. Observant Muslim men cannot wear gold. None. So there goes the big fat gold rolex stereotype you may have had a hunch about. No one could really tell me why this it, there were a few murmurs about blood, an anecdote or two about the prophet, but no exact reason was given. Women on the other hand can wear as much gold as they want. As such, it is considered highly feminine if an Arab man wears gold and you will never see a man here wearing a gold wedding ring. Observant Muslim men can also not wear silk! I must confess that in this subject my students also did not have any concrete reasons, however I was assured that some forego this rule in order to slip on a nice Hermes tie. Perfume is highly important here, not simply as a way to smell good, or if we are to believe the highly raunchy ads displayed in western magazines, to attract a mate; but as a means of personal definition. There is skill involved in the combining of perfumes to create one definite and individual smell that will be admired by other women. It is an art and one that takes much practice. When I asked my girl students if my daughter should be wearing perfume. they were aghast that at the age of 14 Trooper had yet to be shown the art and delights of personal perfumery. According to one delightful 17 year old student, her mother had been spraying her since she was in the 2nd grade! In other news I would like to mention that today is Friday and it is my weekend. So when you crawl from your bed to your sofa and pop in a DVD on Sunday morning as I am already teaching my second class, remember that my Friday was your Sunday. No, I am not yet used to this. It’s been on my mind all day. I was driving Trooper to school, a little four year old, eager and happy for her new school, bouncing in the back of the car. And I was listening to the news. At 9.02. And since I was in Montreal, and on the same time as NYC, I listened as it happened. And the journalists were trying to figure it out at the same time as we were listening. No one knew, no one understood. And then I took Princess to the first day of her play group, and all the other mothers, on their cell phones, worried, pale faced. And I met one of my most special friends in the world. And she had no idea why I was acting so strange. And she thought I was unfriendly. But I was scared. And I couldn’t believe anyone would do such a thing. And it shook me to my core, along with everyone else. We walked in a daze. But I always remember meeting her and starting out wonderful friendship on that date, in the midst of the world falling down. And today, 10 years later, I sat in a classroom with a group of Arab students and listened to their stories of that day, and all their days since. And we talked, deeply and with profound hope about what had happened and what should never happen again. Tearful, celebratory, funny and warmhearted, these last few days. And through it all I feel a huge sense of accomplishment, relief and bittersweet feelings about moving. Leaving is hard and in the past few days I have, again, said more goodbyes than most would in a life time. When Handsome left some 3 1/5 months ago I looked at the mountain of tasks before me and thought it would never be possible. And now I have climbed that mountain and am free wheeling down the other side, I am aware that I am stronger than I thought I was. I have done it all. Marked the exams, written the reports, packed up the house, wiped the tears, clapped my hands, cheered for my girls, hugged my students, tried not to cry, failed and cried, sold the car, paid the bills, dined with good friends, said goodbye to the Nile, went to Jinja, filed the paperwork, danced, said some very hard goodbyes. And I watched as the entire Year Ten stood on their chairs and clapped in my farewell assembly. I was royally roasted and made fun of at the leaving teacher’s function. Created by this clever lady, all my quirky anti camping, cockroach freak out, pedicure loving, car crashing princess tendencies were caricatured and made hilarious in the skit prepared and acted out by a few talented staff members. Of course the show was stolen by my impersonator, the lovely leggy, hard as steel, Aussie MALE PE teacher who donned a short dress, heels and feather boa, all in the name of Theatre. He took it, went with it and made us all laugh, rather than cry. 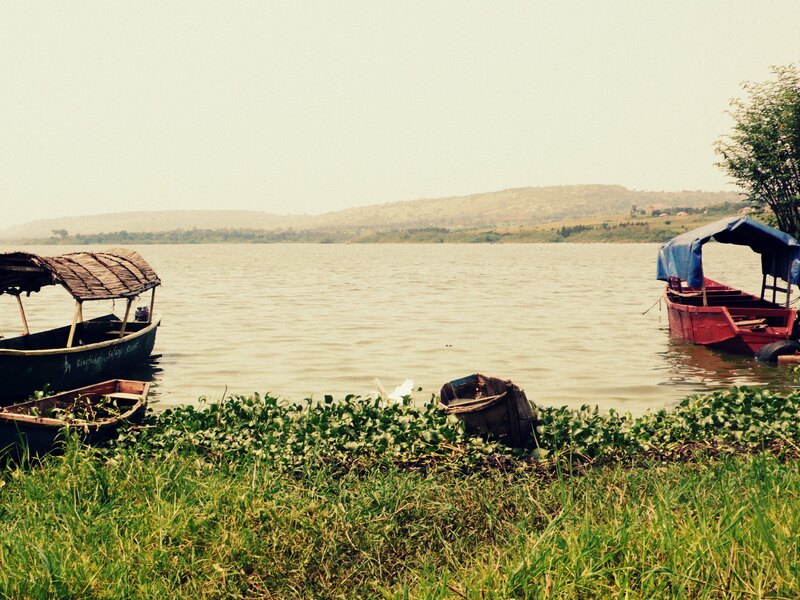 The next morning, despite a night of dancing and tequila I was up and in the car driving to Jinja. A last little jaunt out of town where the girls could swim with best friends, play mini golf, wash off the worries of moving and feel free and glee. And now two more days….then Bahrain. Shhh. The entire school is sitting in a big hall writing end of year exams. Trooper says it will be like Harry Potter, only our hall is open to the elements and has not a gothic balustrade in sight. When you turn to the right you see thick green foliage, to the left, a sullen yellow walk with fans. In a few short hours I will have a thick wad of exam papers to mark, so beginning this week of hell. So this is a quick and short post to tide you over until I come out the other side, weary, perhaps shaken, calloused, but done. The countdown is ticking in earnest; reports and packing still to do but the shippers are booked as are two last minute nights away to gulp the Nile air one last time. Even if I walk backwards on this conveyer belt, I will still end up in Bahrain on June 23rd, no matter what I do. No matter the tummy flutters and the last minute concerns or lists to tick, I will be there, suitcases in hand, probably with the expression of one who has passed through a rather sudden yet expected tornado. Trooper celebrated her birthday in lovely adolescent Pizza style with friends from school. She glowed with happiness and shoved all thoughts of upcoming goodbyes to the nether regions of her glossy head. I left them all alone in a restaurant, thirteen 14 year olds, to behave as adults do and despite my concern over the other paying restaurant clients, it all went off with nary a hitch or broken glass. They know how to behave. Imagine. 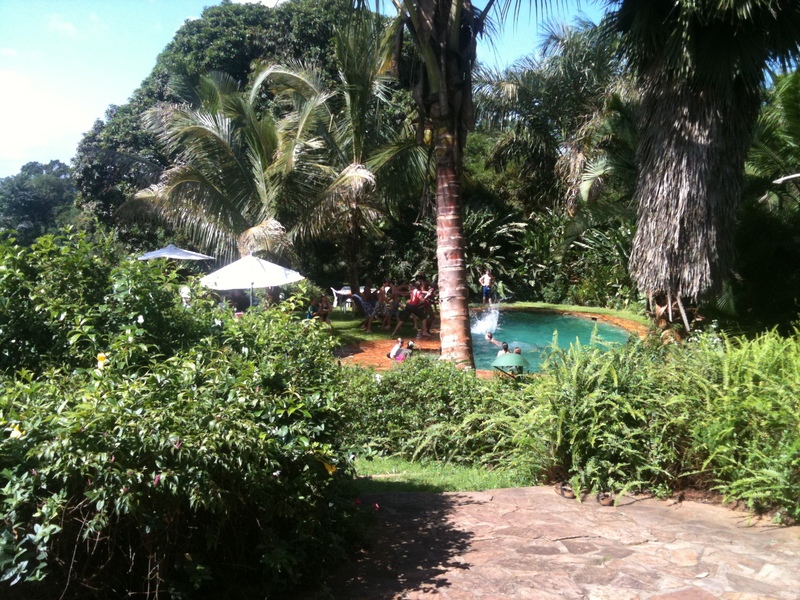 Princess was dropped off at a glorious estate, a 20 minute drive from downtown Kampala that felt worlds away to celebrate a birthday in the wild acres and heart shaped pool of a friend. I saw her bikini clad and prancing at 4 pm and didn’t see her again until lunchtime the next day. My birds are flying the coop, but they still come home for hugs, sustenance and exam revision. I have no funny stories to tell, no witty observations. Perhaps I should just hang up dear 3limes until this craziness is over and I can once again walk, write, breath and sleep without a ticker tape of things to do running widely through my head. The truth is, I am obsessed, as well I should be, considering the leap that I am about to make. But sadly this introspection is of no use to you, readers, and for that I apologize. Still, it is comforting to know that one or two of you are out there following this odd little story. So what do I do to stay sane in these days of limbo? I watch movies (Hangover 2 was a welcome and hilarious distraction), I eat a lot of pineapple, and I drink coffee in the overtly green and lush garden of my good friend A. I look at a lot of green trees and burn their emerald stain into my mind for safe keeping. I work. I work some more. I sort out those little bottles in my bathroom that gather dust instead of being used. 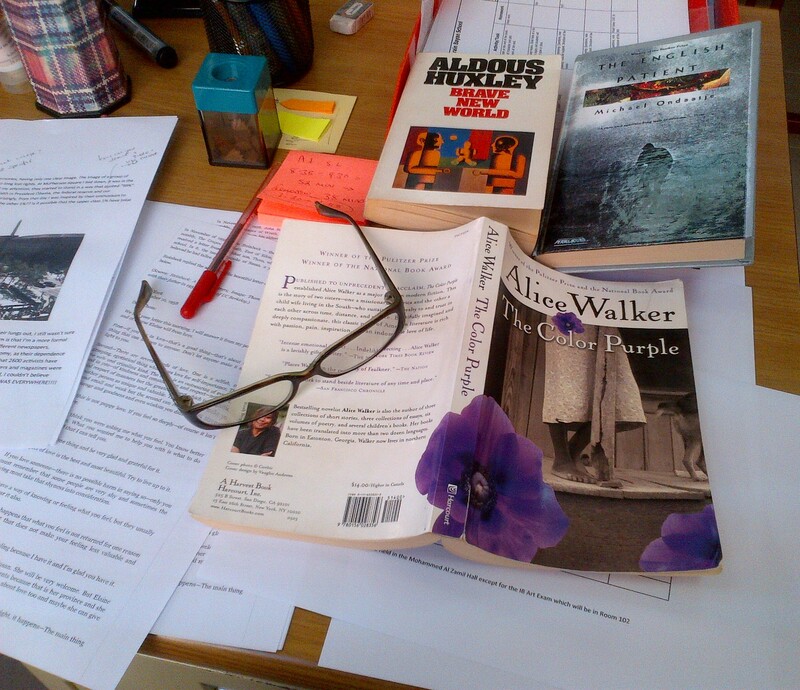 I read short stories, disappearing into other worlds, briefly. I will be back when reports and exams and other academic nonsense is attended to. 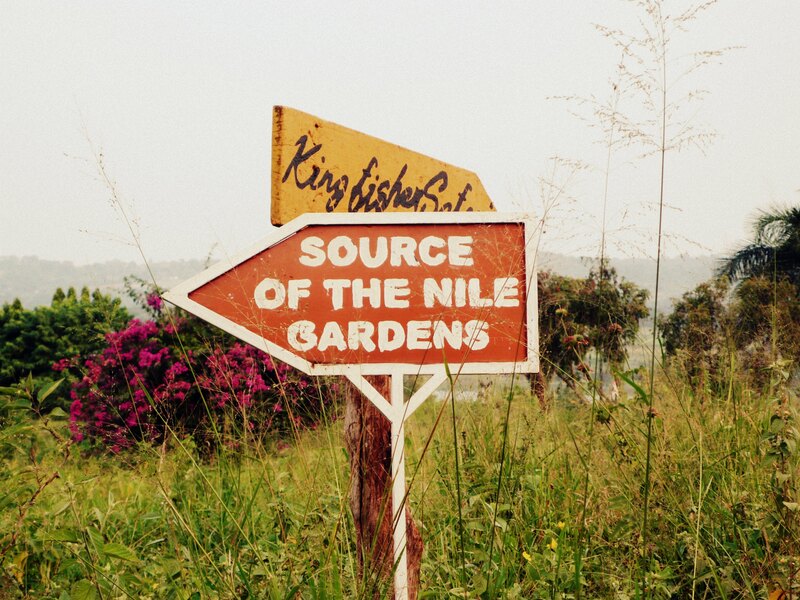 Until then, busy bees, I send you lovely Ugandan golden sunshine, flecked with red dusty kisses. We pass this sign everyday on the way to school and it drives Princess and Trooper crazy. 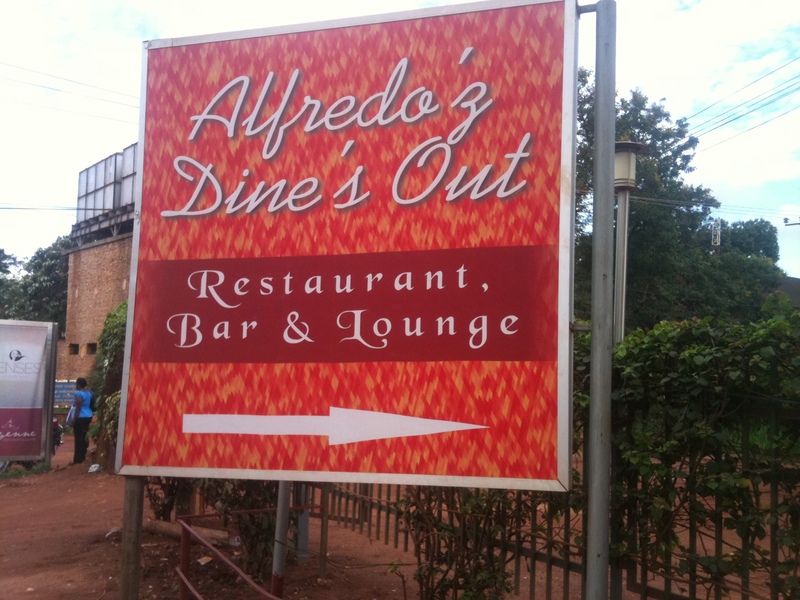 It’s the apostrophes; they cannot comprehend how Alfredo can have a dine out or even be dining out with all those apostrophes in the wrong place. That would be the problem of having an English Teacher as a mother.